Michael Bolton, the multiple Grammy Award-winning singer, songwriter and social activist who has sold more than 65 million records worldwide, was first drawn to Detroit while researching for his album A Tribute to Hitsville USA. The home of his greatest musical influences, he realized that there was so much more to explore about Detroit’s past, present and future. His resulting project, the engaging and uplifting documentary American Dream: Detroit, celebrates the golden age of the Motor City – featuring its native entertainment legends like Francis Ford Coppola, Jerry Bruckheimer, Aretha Franklin, Smokey Robinson and Alice Cooper – and reveals the landscape of a new Detroit being built by young visionaries and entrepreneurial moguls alike. In addition to the documentary, moviegoers will enjoy an exclusive performance from Michael Bolton & Friends, captured live from The Grove in Los Angeles. Tickets for Michael Bolton Presents American Dream: Detroit go on sale to the public on Friday, April 13th at FathomEvents.com and participating box offices. Michael Bolton fans can get early access to tickets on April 11th by signing up in advance at MichaelBolton.com. 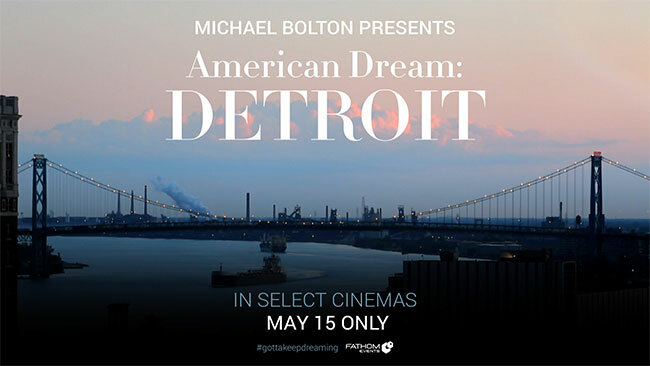 Fathom Events and Passion Films bring Michael Bolton Presents American Dream: Detroit to over 450 U.S. cinemas for one night on Tuesday, May 15th at 7 pm local time, through Fathom’s Digital Broadcast Network (DBN). A complete list of locations will be available April 13th on the Fathom Events website (cinemas and participants are subject to change). This documentary illustrates why the history and the future of Detroit matters in the global landscape. Told through the eyes of Bolton’s own discovery, this important story has remained largely obscured by mainstream media’s preference to portray only the devastation of the city’s downfall, until now. This is the story of the American Dream.